Bridegroom Tom Nixon and Bride Kate Tomaino stand with Ali of Monkey Boutique after their wedding ceremony at St. Joseph’s Church. Photo — Rick Burner. To the sounds of Dylan’s “Love Means Zero—No Limit”, Tom and Kate were married Sunday, July 7. Tom Nixon, ex-chairman of the Draft Resistance Committee, and Kate Tomaino, of the Cambridge Book Stall on the Wayne Campus, chose St. Joseph’s Episcopal Church as the scene for their Episcopalian-Hindu rites wedding. Officiating at the ceremony were Tom’s father, the Rev. James Nixon and Rev. Robert Morrison. 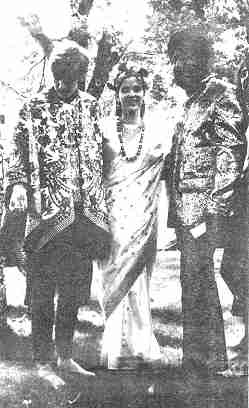 The Hindu rites were performed by Suresh Kulkarni, a close friend of Tom and Kate’s and a member of the Brahman faith. Only the invocation portion of the Hindu ceremony was included. The bride wore the ceremonial Hindu bridal Sari, complete with stained red spot on her forehead, painted feet and the bridal bindi in her hair. The groom, as well as the entire wedding party, wore traditional Hindu garb right down to being barefooted. Music for the service was supplied by two more friends, David and Roselyn, who sang the Hawaiian Wedding Song in Hawaiian as well as Dylan’s beautiful love thing. Roselyn played the African Kalimba, a small hand-held thumb-piano, accompanied by David’s guitar. The Hindu ceremony was included because of Kate and Tom’s intense interest in the Eastern culture and religion. Only a part of the full Hindu ritual was performed, and in essence it consisted of the traditional invocation to the Gods, calling down their blessings upon the bride and groom. The wedding party then showered the couple with multi-colored curried rice, symbolizing the raining down of the blessings of the Gods. The colors dyed into the rice symbolized the glory, love, and kindness the bride brings into the groom’s family. The Grande Ballroom was the setting for the reception Sunday evening: food, by Alvin’s Delicatessen, with music 131, the Rhythm Method, Billy C. & the Sunshine, David and Roselyn, and a band headed by tenor Saxophonist Joe Sokolov.